We started our trip by folding up the bikes and hopping on a series of local trains to take to Kushiro in Eastern Hokkaido to visit the Shitsugen or wetlands that are home to the Red-Crowned Crane or Sarurunkamui. At one of the stations we had a few moments to step out and stretch our legs, and to sample some local soba. Most stations offer some kind of bento - ekiben - and are often famous for a particular type (Shinjuku purportedly makes a mean fried chicken), but we usually have an onigiri or two on hand. The smell wafting out the window of the little soba shop at this station, though, proved too much. 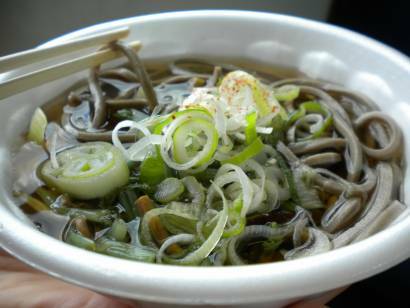 We gave in and shared a bowl of sansai (mountain or wild vegetable) added to a steaming broth and good thick soba noodles. Served up fresh and steaming in a blink of an eye in a styrofoam bowl (the only bummer about the dish, really) it is incredibly cheap (350 yen), ridiculously delicious, and tremendously satisfying.